Quiet and shy were the words used to describe Army veteran Scott Ramsey when he visited the service dog training program at a Texas state women’s prison. Scott had come to the prison to meet his new canine partner. Scott suffered a traumatic brain injury when an explosion went off close to his Black Hawk helicopter. Now, severe balance issues prevent him from getting up and moving around without assistance. With his constant requests for help, Scott felt like he was burdening his family, especially his two young children. He was excited about getting a service dog, as he knew a dog would help him get out again and do more things for himself. Scott and Lincoln -- a perfect match! Placing a service dog is a lot like matchmaking. There were several dogs that could be matched with Scott, all trained and capable of providing the specific help Scott needed. Scott met and worked with all of the dogs so that trainers could determine which dog would be the best fit for Scott and his family. By the end of Scott’s second day at the prison, everyone knew Abraham Lincoln was his dog. When Lincoln was around, Scott was no longer quiet; in fact, his behavior earned him the title of class clown. When Scott and Lincoln were separated—Scott with a different dog, Lincoln with a different handler—they watched each other across the room. It appeared to be love at first sight. Brian Fields also made a visit to the prison. Another Army veteran, Brian lost both legs in an explosion in Iraq. Brian’s wife had stepped into the caretaker role, helping Brian get in and out of a wheelchair. But when she injured her back lifting him, Brian felt responsible and lost motivation, despite receiving prosthetic limbs, a tremendous tool for gaining mobility. Brian had specific requirements; he needed a strong and solid dog to help with balance (walking on prosthetics is often described as walking on stilts) and help perform other routine tasks. The Fields household is very active, with children and a shared love of sports ensuring few dull moments. To fit into that lifestyle, a service dog had to be unaffected by noise and activity. Enter Justice, a yellow Labrador retriever. Tall and solid, she could easily assist Brian with his balance. She loved children, and was a social butterfly. A saddle maker in Texas created a custom harness for Justice that distributed weight across her body. With that harness, Brian could transfer his weight to stand up, sit down, and walk on his prosthetic limbs without putting undue stress on Justice. The trainers hoped for a match the first time Justice picked up Brian’s prosthetic legs and brought them to him. But how would she do with the family? Justice went to the Fields’ home for a weekend visit. When Brian called to say he and Justice were lying in the shade watching his kids swim in the river, everyone knew they had a match. Lori Stevens, a Karen Pryor Academy (KPA) Certified Training Partner (CTP) and certified by the Certification Council for Professional Dog Trainers, is the daughter of a veteran. She has always had a deep sense of patriotism, and for more than 20 years has worked and volunteered for several service-dog training organizations, helping thousands of pet owners train their dogs. During a 2005 visit to the Veteran’s Administration Hospital in Dallas, a group of veterans asked Lori to help them train their own service dogs. Their stories tugged at her heart, and when she realized the extent of the need for service dogs among veterans, Lori found her calling. 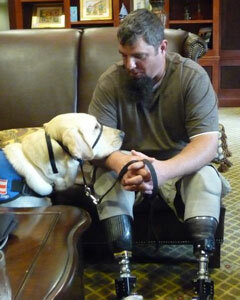 In 2006, Lori established Patriot Paws to improve the lives of disabled veterans by providing service dogs. Patriot Paws was designated as a 501(c)(3), and operations began in the building Lori leased for pet dog training classes. Placing a service dog is a lot like matchmaking. 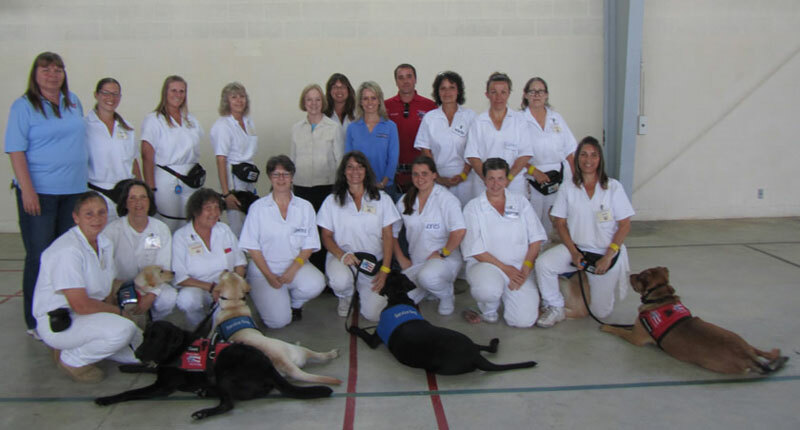 In 2008, in conjunction with Texas Department of Criminal Justice (TDCJ), Patriot Paws developed a program to train prisoners to train service dogs. Female offenders from two TDCJ units were selected to participate. In the spring of 2010, Lori invited Karen Pryor and me to visit and learn more about the program. I was excited and, I admit, a little nervous about the visit to the TDCJ facility in Gatesville, Texas. Karen and I arrived early on a beautiful spring day and Lori reviewed some rules before we entered the facility. We could bring in only our driver’s licenses—cell phones and purses had to be left in the car. I felt a bit rebellious with a hidden tissue in my pocket! We waited in the parking lot, away from the high prison fences and gates, and watched while a bus made a complicated exit from the facility. One gate opened, the bus drove past the gate, and the gate closed behind it. Next, a second gate opened, allowing the bus to exit and find the road. Finally, the second gate closed behind the bus. Only after the bus had traveled a good distance away did Lori lead us to the gate to make our own entry. The gate closed solidly behind us, too. We were told to walk down the middle of the street toward the gymnasium, between two yellow lines painted on the street and sidewalks. Prisoners, referred to as “offenders” at the facility, must walk on the outside of the yellow lines. Women from the two units that make up the Patriot Paws program, the Lane Murray Unit and the Christina Melton Crain Women’s Correction Unit (Crain Unit), gathered in a gymnasium with their dogs. As we entered, the offenders were walking their dogs in a large circle around the gymnasium. We were greeted with eye contact, genuine smiles, and some nervous laughter. The offenders had prepared a short skit for our visit, a reenactment of a day in the life of a service dog. Narrators with carefully prepared scripts led us from one scene to the next, acting out a day of shopping. At the “supermarket,” Sioux, a Bernese mountain dog, loaded items into a shopping cart and then unloaded them for checkout. At a “shoe store,” Jazz, a yellow Labrador retriever, removed an offender’s shoes and socks so the woman could try on a pair of shoes. A stop at a “coffee shop” introduced Rocki, a black Labrador retriever, who carried money to the cashier, paid the bill, and returned with the change. Finally, a group of “wheelchair-bound” offenders acted out going to the movies with their dogs. Homemade posters indicated that they were going to see the recent hit, How to Train Your Dragon. After the skits, the women and their dogs lined up against one wall of the gym, the dogs arranged in order of training levels. The women cued their dogs to sit and lie down in unison. They treated us to a “wave,” like you might see at a ballgame. From right to left, each dog lay down in turn and then, moving left to right, each dog returned to sit position, completing the “wave.” We laughed as we applauded. These creative demonstrations showcased the women’s wonderful training skills and the dogs’ many behaviors. 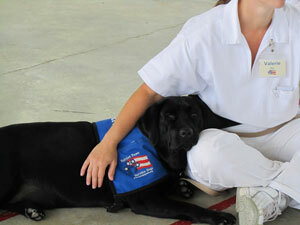 Prison offenders use clicker training to train the service dogs. Prison offenders use clicker training to train the service dogs. The women we met all had read at least one of Karen Pryor’s books, and were eager to learn more. Patriot Paws trainer Sam Graeff spends several days each week at the prison working with the offenders and dogs. He explained that while the attrition rate of trainers is extremely low, there is some turnover. Some women are paroled and others are excused from the program for various reasons. The responsibility of training new offenders is nearly continuous. Every eight weeks, dogs are reassigned to a different handler. There is a changeover period to ensure a smooth transition for both dog and handler. The offender who has been working with a dog for the past eight weeks is tasked with teaching the new handler all about the dog: training level, learned behaviors, and more. An important part of the changeover is teaching the new handler the dog’s cues. Handlers must be consistent, so that previously learned behaviors stay strong and the learning process continues to move forward. Sam Graeff had heard about TAGteach™ (Teaching with Acoustical Guidance) and asked us how to utilize TAGteaching working with new trainers and during the transfer of dogs from one handler to another. Like clicker training, TAGteach breaks skills down into small pieces and teaches each piece separately. Working with humans, we can use language as a marker. A service dog’s learned skills can be complex, and hard to pass on to newcomers. Sam asked us to explain how to TAGteach the “get back” cue. He and the trainers demonstrated the “get back” cue where, from any position, the dog is told to return to the handler’s left side. The cue requires the trainer to move both her left leg and left arm in specific motions at the same time. (It reminded me of rubbing your tummy and patting your head!) It can be done, but it takes some practice. Karen suggested I take on the TAGteach job. Handlers must be consistent, so that previously learned behaviors stay strong and the learning process continues. First, I asked a trainer to demonstrate the cue a few times, without a dog, so we could decide how to break down the cue into small pieces. After watching the demonstration, we broke the cue down into three elements: left leg steps back, left arm swings back, left arm returns to side with palm up. Sam picked a skilled offender to be the trainer and another with less experience to play the role of learner. First, I suggested the tag point be to step back “one foot.” We discovered this instruction was open to interpretation—did we mean 12 inches, or the distance of a human foot, which is variable? So we tried “12 inches.” The first tag point was “step back 12 inches.” We used the verbal marker “tag!” when the learner succeeded in stepping back 12 inches. A few repetitions established that the “stepping back” behavior was consistent and the learner was comfortable with it. Next, we focused on the second element, swinging the arm backward. The learner said it felt like “12 p.m. to 6 p.m.” on a clock. Perfect! The tag point was “arm from 12 to 6 o’clock.” Again, the offender playing the trainer said “tag!” when the learner moved her arm in a way that met the criteria of our tag point. At each step, the learner had to concentrate only on that single tag point. For the third element, arm at side with palm up, the trainer modeled the pose. I asked the learner to describe it. She said it reminded her of holding a pizza. So the tag point was “holding a pizza.” She’ll remember that! It works best to ask learners to come up with the tag point descriptions. Once the learner felt comfortable with the individual pieces, we put them together into one movement. The learner performed the elaborate cue beautifully, perfectly consistent with her teacher’s version of the cue. Success! The women were engaged and open to learning, and there was plenty of smiling and laughter from the participants, from the other offenders watching, from the visitors, and even from the prison guards. Later in the day we visited the Crain Unit, home to about half of the offenders in the Patriot Paws program. There we got a sense of daily life in prison—long, austere hallways, guards and medical personal crossing our path, a small dayroom with a single, small television hung from the ceiling, a peek at the commissary and its small selection of snacks and prison-approved supplies. A white board in the commissary listed available ice cream flavors. As air conditioning and cold drinks are unavailable luxuries at the prison, ice cream is a special treat on a warm Texas day. In the dorm-like room where we met, a large Patriot Paws logo was painted on the floor at the entry. The women had also painted paw prints on the plain blue curtains. Above each narrow bed was a photo of a dog, or a veteran and a dog. The women gave us a photo tour, telling us about each dog and veteran. The picture they were most proud of was a collage showing all of the veterans and dogs that have been part of the program. The women did not emphasize their own training accomplishments; instead they lit up telling us how the lives of veterans have been changed through the dogs. They lit up telling us how the lives of veterans have been changed through the dogs. The dogs in training rested on the floor or in kennels. Relaxed sighs indicated that they were perfectly at home in the dorm. A door at the back of the room led to grass yards enclosed by a fence and locked gate. We looked at some of the logs kept for the dogs. The Training Logs were well-organized, with specifics about the level of training each dog has achieved, and about progress made toward behaviors in the next level. A Behavior Log provided details of any unusual or problematic behaviors, such as fear or reactivity (a service dog cannot have unpredictable reactivity, of course). How do offenders join the program? Women apply for the position; 22 women currently participate. Offenders learn to teach and train through reading, videos, hands-on lessons with Patriot Paws staff, and 24-hour interaction with their dogs. Just as it is for the dogs, the trainers’ learning is broken down into levels of achievement; they are given specific assignments and tasks. To achieve the third, and highest, level of training skill, offenders must create a curriculum for teaching a six-week pet manners class. Patriot Paws helps the program participants create resumes that detail their teaching and training accomplishments. All of the women from the program who have been paroled aspire to work as dog trainers. In fact, Patriot Paws has hired one parolee as a trainer at its Rockwall, Texas facility. Assistant Warden Melody Nelson is clearly proud of the program. She told us about the positive influence the program has had, not only on the participants, but on the prison population as a whole. It’s hard to say exactly what has caused the change in dynamics. We know from the world of therapy dogs that petting a dog can have a calming effect, and can even slow heart rate. 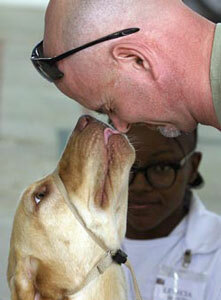 There is a social benefit to the program, too, as dogs are a wonderful conversation-starter. From clicker training and TAGteach we know that teaching and training with positive reinforcement techniques overflow into all aspects of people’s lives—impacting how they interact with children and spouses, co-workers, and, apparently for the prison participants, impacting fellow offenders as well. Some of the offenders shared that they had taken freedom for granted, selfish and concerned with their own needs rather than others. Now they have an opportunity to give back. It is especially meaningful that the veterans in the programs were disabled fighting for the freedoms these women lost when they became incarcerated. The obvious benefits of the Patriot Paws/TDCJ partnership program include the invaluable resources of volunteer trainers and the ability to match many veterans with quality service dogs. Patriot Paws can place more dogs with veterans in a shorter time; the TDCJ units can train up to 22 dogs at a time. Another clear benefit is to the prisoners. The offenders in the program learn skills that can lead to a satisfying and productive career when they are released from prison. Above all, participants learn to think and live positively. There are many less tangible benefits, especially for the offenders: confidence and self esteem, teaching and public-speaking skills, the ability to take full responsibility for a dog, and a learned respect for others, one that focuses on group improvement rather than individual successes and failures. Above all, participants learn to think and live positively. I am overwhelmed with respect and admiration for every person and dog involved with the Patriot Paws program, and cannot imagine a better example of a win-win situation. As our visit with the Paws trainers, program participants, and dogs ended, we took a group picture. I realized that my face hurt from smiling! I knew that this experience would be touching, but I never imagined it would be so much fun. Dogs are provided free of charge to disabled veterans, and are trained to perform tasks based on each veteran’s specific needs. As a non-profit, Patriot Paws relies on donations to cover the exorbitant cost of training and caring for a service dog. If you would like to make a donation, please visit http://patriotpaws.org/. Tia Guest is Program Director of Karen Pryor Academy, as well as a professional animal trainer. Don't miss Karen Pryor Academy grad on NBC Nightly News, May 13!